It’s really not THAT sour and there’s a lot more going on besides just the sour flavor – hints of sweet, salty, spicy (though not super spicy) all fuse together for a wonderfully flavorful and soothing soup. 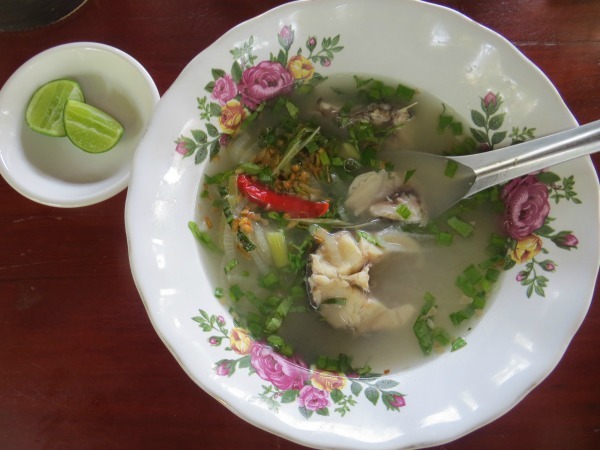 Cambodian sour soup has many manifestations throughout Cambodia using a wide range of ingredients. They often include lemongrass, galangal, cilantro and other local herbs, green onions, fish sauce, sugar, chiles and different meats. The sour flavor often comes from tamarind and/or lime. In this recipe we’ll be using lime juice. 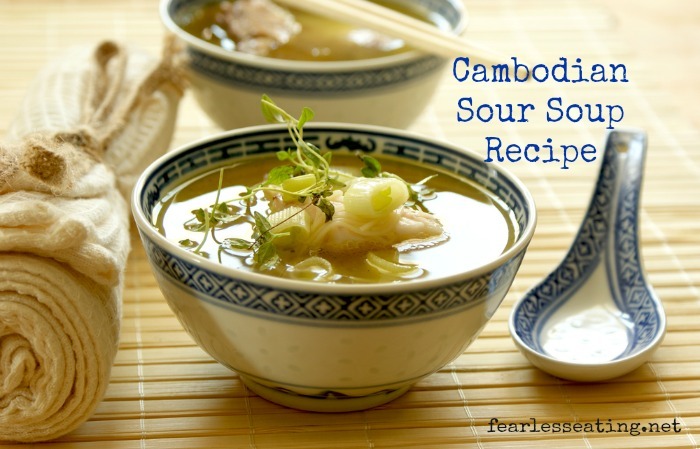 I’m going to share with you exactly how I learned to make Cambodian sour soup in Cambodia. But don’t worry, the reason I’m sharing this recipe is because it’s not only incredibly simple but all the ingredients are easy to find in your local supermarket or health food store. Lemongrass might be the only thing you need to seek out. Most Whole Foods now carry lemongrass and any Asian market will certainly have it. If you ever find yourself in Cambodia, you’ll certainly find yourself at some point in Siem Reap. It’s the bustling small city just outside the epic Angkor Wat and the indescribably awe-inspiring and beautiful temples of Angkor. Siem Reap has become a trendy international cultural hot spot in the past 20 years due to the influx of tourists. And there’s now a lot to do besides just visiting the temples. When you need a break from temple touring, I’d HIGHLY recommend taking a cooking course with Lily Austin Danz who is the owner and chef of Lily’s Secret Garden. It’s a great way to learn about Cambodian food, which has its own unique flavors and traditions. 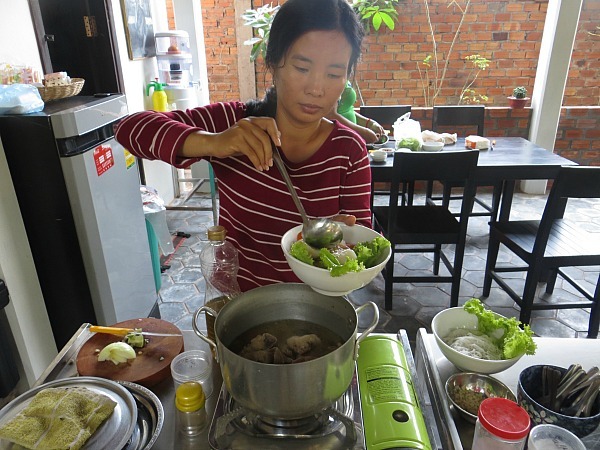 Lily offers group cooking classes at her beautiful country home just outside downtown Siem Reap however she made an exception for me one day when I requested my own private class. I really wanted to learn how to cook a Cambodian sour soup (and a few other soups) which is a little more detailed than what she typically offers in a group class. Click here to check out Lily’s Secret Garden Cooking Class. 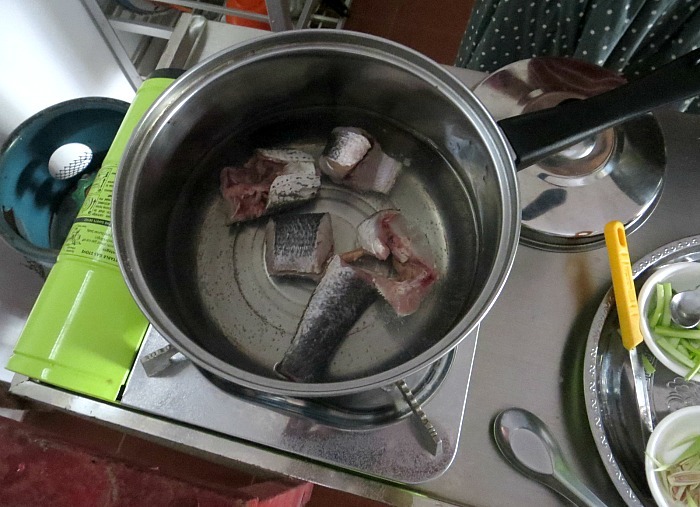 In this recipe, we used fish for the meat but you can use any meat you want – chicken, beef, pork, shrimp, squid, etc. Personally, I think fish is best because it’s light and delicate texture complements the soup well, which is typically a light broth-based soup. Using a whole fish also creates a nice light fish broth. But yes, you have to use a whole fish for this. In Cambodia (and in every other southeast Asian country) whole fish is used more than fish filets for many reasons. I discussed this in my last post, 9 Things Cambodian Food Can Teach America About Food. Whole fish has more nutritional benefits than just fish filets. For example, there are many fatty acids and trace minerals (such as iodine) are concentrated in the head of the fish. 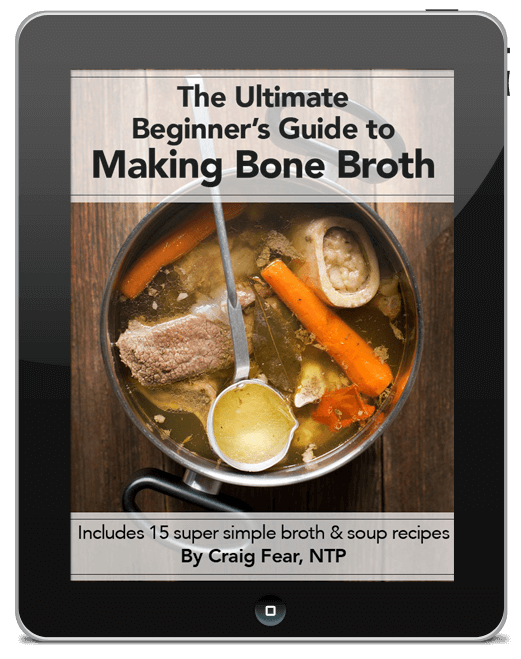 And using a whole fish is a great way to make a fish broth. I’m not sure what type of fish Lily used but it was definitely something from the Tonle Sap lake, the nearby huge lake (the biggest in southeast Asia) that provides Cambodia with most of its fish. It was a small fish, meant for two people, about 9-10 inches long. A small trout would be a comparable fish to use. Just chop the fish into 5-6 chunks. Your fishmonger can do this for you too. But if you want to use fish filets you certainly can. It’s not that big of a deal. You could use any type of fish you want. If you use do fish filets you’ll need to use a pre-made fish broth or chicken broth in place of the 4 cups of water. Lime juice and Cambodian herbs and spices shine through this very simple broth-based sour soup recipe. Bring water to a boil and add all ingredients (except the chiles and onions), including the whole fish, and simmer about 10-15 minutes until fish is cooked through. If you're not using a whole fish, sub fish or chicken broth for water and simply add the fish filets in step 4. Taste and add more fish sauce, sugar, salt and/or lime, to taste. Add whole chiles and simmer for about another 10 minutes. Add white onion in the last few minutes. Ladle soup into individual bowls and serve with a side of white jasmine rice. Add garnishes of green onions, fried garlic, cilantro leaves, lime wedges and fish sauce, to taste. Yeah I know, not exactly as pretty as the cover picture. But I needed a better pic than this one. My little travel camera isn’t the best and the light wasn’t great. But that’s the actual soup we made. And it tasted ABSOLUTELY AMAZING. 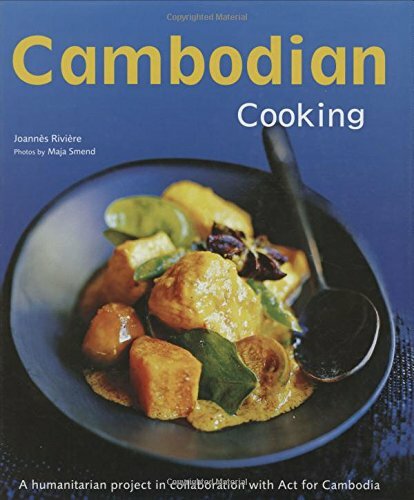 Here’s a great book, Cambodian Cooking, with easy recipes, to get you started. 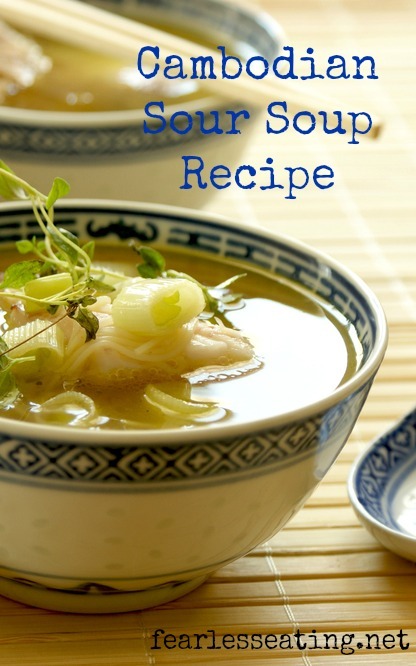 It’s a nice introduction to Cambodian cooking with a small chapter on soups, including a Cambodian sour soup. Great book to add to your cookbook collection!